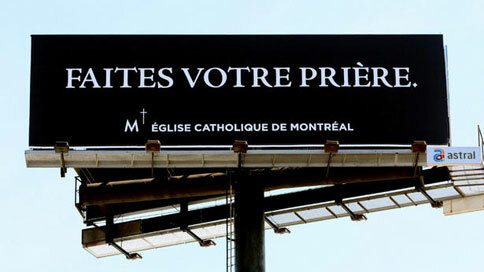 Just in time for Holy Week, the Roman Catholic Church of Montreal is sending a message with political overtones via a controversial highway billboard that reads, "Faites votre prière" ("Say your prayers"). The board, created by ad agency Bos, greets motorists as they approach the Champlain Bridge, which spans the St. Lawrence River and connects Montreal to its southern suburbs. The 50-year-old span is badly in need of repair, and local debate rages over funding a fix or building a replacement. "For sure we're associating with those who are asking for a safe structure," an archdiocese spokeswoman says. "But we're not going to delve any deeper into this issue. It's really just to associate with them in a humorous way." Yeah, putting an alarmist message near a rickety bridge is plenty humorous. The Catholics should leave the comedy to the Scientologists. They're much funnier, like when they claim to be running a religion. The spokeswoman adds, "We didn't think it could be a morbid ad, since at this moment authorities are assuring us that the bridge is completely safe." From her mouth to God's ear!